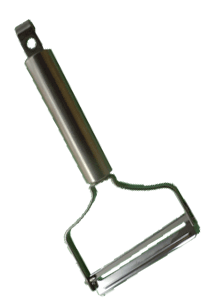 Simple Slicer – THE Polymer Clay Tool for a Cane Klutz? for A Polymer Cane Cutting Klutz? Can the Simple Slicer help even this polymer clay cane and mokune gane butcher? I confess, I'm no blade master. But Lee Ann Armstrong showed this all thumbs artist how to cut polymer canes and mokume gane billets into paper thin, uniform layers using this inexpensive tool (only $50...cheap!). We met face to face in an online video interview/hangout/review and demo. 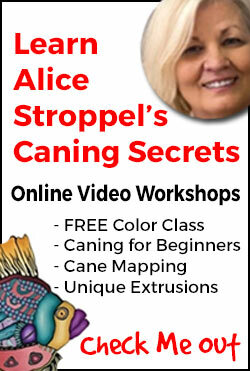 Expert cane slicer Jill Palumbo joined in our chat with more tips. And Nora Pero showed us all just how far we can stretch a clay pattern with one of these tools. I’d also like to thank Randee M. Ketzell and Nancy Nearing for their efforts to join in this Google Hangout. They were on mobile devices and although individual system tests worked, the phones and tablets just couldn’t handle multiple video connections wirelessly. Interview? This Was More Like A Private Tutoring Session! Those that watched this event online got an hour long instructional lesson with Lee Ann. I’ve edited the video to less than a half an hour. Think of it as a free tutorial from Lee Ann. Here are the highlights and important points. You can find them easily on the video at the noted time stamps. First, I’d like to acknowledge and thank both our husbands who acted as video camera tripods. Thank you Larry Armstrong and Bob Ulrich! What can you expect to find when you unbox your Simple Slicer? I discovered a sturdy and well finished acrylic and fine plywood box (the Slicer), a stack of index cards, a flat acrylic sheet (the tray). I already had purchased one of Lee Ann’s plastic peelers with the metal cutting blade. This tool comes in two different sizes. Both are 3 inches wide. But the Simple Slicer I is 5 inches long and the II is 10 inches long. 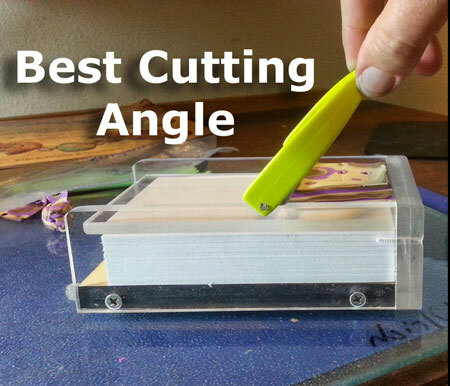 How to keep your Slicer safe while travelling or even at home on your work table? Keep the sides aligned by storing the index cards in the Slicer. And keep the box that it came in. It’s the best way to transport your slicer. How do you keep it from slipping and sliding when you’re cutting clay? Don’t try too hard when shaving canes. Let the blade and the special feet do the work. Here’s Lee Ann Armstrong’s fast tutorial for the Simple Slicer. Watch just this segment if you don’t have time to view anything else. Place the clay block along one short edge of the tray. Press the polymer down firmly to the tray on a flat surface or use a brayer to firmly adhere the clay to the tray. Place the tray into the slicer box with the clay against the label side. Add or subtract index cards to change the cutting level. Easy card counting tip! Find out how many cards Lee Ann uses for most slicing and why. Watch Lee Ann do another quick demo. And find out why translucent clay is the best for clay ‘bumpers’. Admire the holes! You won’t believe the stunning results of Nora Pero’s experiment. 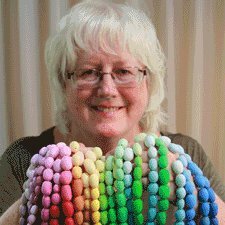 She set out to discover how many bead cores she could cover with 1 and ¼ blocks of Premo and this polymer clay tool. Care to guess how many? 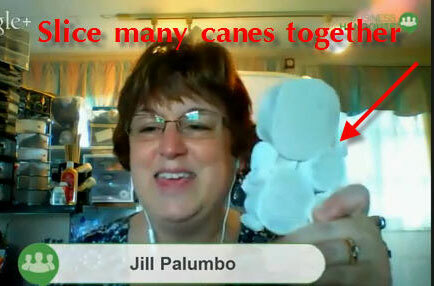 You must see Jill Palumbo’s cane packing tip. One thing that’s always bugged me about cutting polymer clay canes is that you have to be so careful when you chop to avoid distorting them. But you’ll be surprised at how easy it is to cut multiple canes at once with identical thicknesses. I’m the expert on how NOT to do it and the proof is on the video right here. Please don’t laugh so hard at me that you miss all of Lee Ann’s good advice. Yeah, I’m THAT klutzy with a slicer. I actually do a funky chicken. 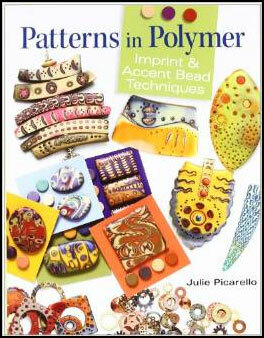 And we all love Julie Picarello’s book Patterns in Polymer. Just go buy it at Amazon. Now you can actually DO all that stuff. What’s the best way to hold a mokume gane block down on the tray while you’re pulling the peeler? Lee Ann will show you where to place your hands. A few drops of liquid clay will also help. Do you hear that grinding noise? The blade you save may be your own. And your cutting edge is probably digging into one side of the Slicer. Center that blade! I showed Lee Ann something new to do with the plastic peeler handle and blade. It was novel, but not terribly effective. 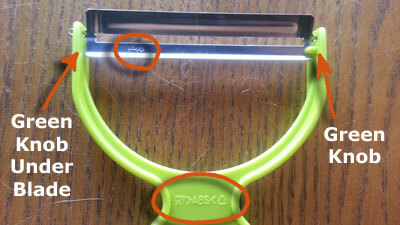 Here’s how to correctly place the blade in the handle if you accidentally shift the blade’s position. Lesson learned; don’t bear down hard on your tools like I do. The blade is sharp. Let it do the work. The Most Important Tip – Safety First! The blade is SHARP! Make sure that your fingers stay intact. Keep them away from that sharp blade by holding the clay stack at the edge furthest away from the label end of the slicer. Slice carefully. Just watch this little bit, ok? Which Peeler is Best for You? Lee Ann Armstrong sells 3 different peelers. They are sold separately from the Slicer box. There’s one for every budget and physical needs challenge, whether you have arthritis or problems with your sight. With the right peeler almost anyone can create beautiful layers of polymer cane slices or mokume gane overlays with the Simple Slicer. You can use a regular rigid tissue blade to cut with this polymer clay slicing tool, but its so much easier with a peeler. I just purchased the Professional Peeler and an extra tray. Because I tend to bear down on my tools, I've come to the conclusion that this is my best choice. I am SO getting into slicing clay now! Hi, I'm a wife (husband Pat), mom (two sons, Nick- 18 and Vince - 14), sister, friend, and teacher. l love studying languages and I love art and nature. My favorite thing to do is create with polymer clay. The languages I teach are French and Japanese, and I'm learning Spanish. Lee Ann is married and lives in Indiana with her husband, Larry. Lee Ann and Larry work together to make The Simple Slicer. 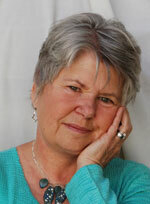 She is currently retired and always had a love of crafting and color but never pursued it. So when Judy Belcher was on Carol's show and mentioned a retreat in Kentucky Lee Ann thought, "I should go and try that". She bought a cheap pasta machine and some clay and made her very piece at that retreat in Kentucky. Lee Ann also met her dear friend and mentor, Faith Vahle at that retreat. Faith invited her to attend the Indiana Polymer Clay Guild in Indianapolis. That was 2006 and the beginning. Ask Your 'Simple Slicer' Questions Here!